WarioWare Inc.: Mega Party Game$! 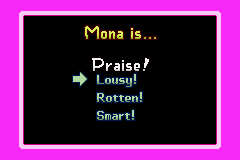 Praise or Haze II is one of Orbulon's microgames found in the IQ folder in WarioWare, Inc.: Mega Microgame$! and returns as one of Wario Deluxe's microgames in WarioWare Gold. The game will ask what the player thinks about someone or something. The objective of the game is to follow the directions on the bottom of the screen by praising or hazing the person, object, game or player. This is done by choosing the correct answer. 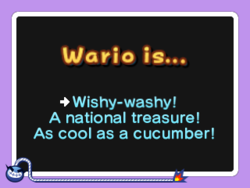 In WarioWare Gold, the character is always Wario. 1st level difficulty: There are three selections. 2nd level difficulty: There are four selections. 3rd level difficulty: There are five selections. Italian Bello o brutto? Good or bad? This page was last edited on October 20, 2018, at 07:42.